To breed and to contain the fish aquarium, it is required that the hardness of the water in the aquarium was a constant. If aquarium soil consists of coarse sand and river pebbles, the water in the aquarium will always have a certain stiffness. In aquariums which contain fish and shellfish, stiffness decreases with time because of consumption of calcium shellfish to build shells. Therefore, it is necessary to periodically increase. - distilled, rainwater or melt water. To increase the rigidity of water, boil it in enamelware for one hour. Carefully pour two thirds of the waterremaining, enriched with calcium gradually in a thin stream pour into the aquarium. Prepare or buy in the pharmacy a 10% solution of calcium chloride (CaCl2) and 10% solution of magnesium sulfate (MgS04). To increase the rigidity of water by 1 °dGH dispense 100 l of water of 18.3 ml of 10% calcium chloride (CaCl2) or 19.7 ml of a 10% solution of magnesium sulfate (MgS04). For maintaining fish and plants need the ratio of ions to incorporate these solutions in approximately equal amounts. To increase carbonate hardness put in aquarium water carbonate rocks (dolomite, chalk, marble, etc.) or pass it through marble chips. But remember that the dissolution of carbonate rocks in water is possible only in the presence of carbon dioxide: CaCO3 + CO2 + H2O -> CA(HCO3)2 To do this, add water or sparkling water for saturation water CO2 use a special device. Carbonate to increase the hardness by 1° dKH dissolve in 100ml of 1.5 g of MgCO3 (magnesium carbonate) or 1,8 g of CaCO3 (calcium carbonate). But it is better to use both salts in equal parts. Add to the aquarium water 25% solution of magnesia at the rate of 1 ml per 1 liter of water - this will help increase the hardness of the water to -4°. Mix the pooled water and distilled water. If the hardness of water from the tap - 10 N°, mix 7 parts of distilled water with 3 parts tap waterto get the aquarium water rigidityu 3 N°. In the absence of distilled water in towns and villages with low gas content of air will change rain or melt, the rigidity of which is 2-3 N°. Put on the bottom of the aquarium shellfish shells or coral chips. Previously within hours vivaria them. 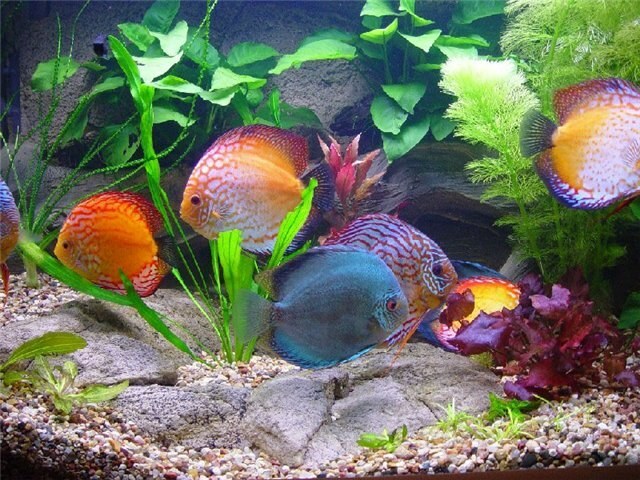 Change 1 time per week of the total 10-15% water, not pereselyayte aquarium, and the hardness of the water will not be constant.